75,000 jars of Vegemite are being distributed to supermarkets around Australia bearing the photo of Melbourne medico Dr Peter Schiff. The 76-year-old doctor from Kew is one of ten Australians with special stories to tell selected by Kraft in a special Australia Day promotion. Peter Schiff was an 18-yr-old third year medical student when he volunteered to work evenings delivering life-saving blood and plasma for the Blood Bank. 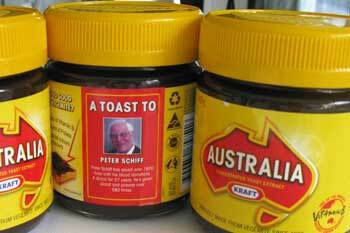 Kraft have been making Vegemite in Port Melbourne for 89 years and Dr Peter Schiff remembers eating it on toast from his early childhood. The food-maker has temporarily changed the name of the iconic product from “Vegemite” to “Australia” to mark its special place in Australian culture. 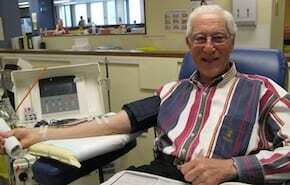 Dr Schiff will continue to make his fortnightly trip to the Red Cross in the city to donate his plasma…and will continue to do so for as long as he can. In the meantime, 75,000 Aussies will breakfast with Peter Schiff’s photo on their table and a jar which will tell them that the photo is of a man who “has saved 1600 lives by donating blood”.